Owls are amazing creatures. If you watch them closely, it is amazing how complex, and yet, graceful they can be. This shot is from a trip to Grand Teton National Park in June of this year. Unfortunately, the trip was marred by a ton of rain every day. This presented a bit of an issue for someone who was looking to do a lot of nature and wildlife photography. 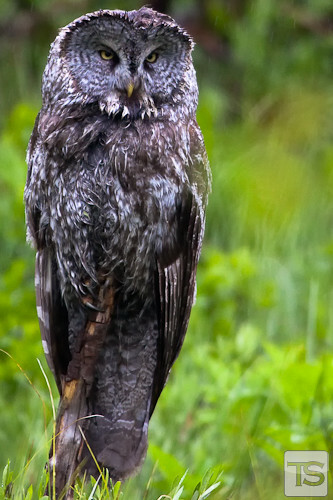 Despite the rain, my wife Erin and I came across this owl sitting out in the rain and decided to stop. The rain gear was applied to the camera gear and out we went. What amazed me was this owl was as interested in me, and the other photographers who were there, as we were of the owl. The curiosity of both species was equal. Although a bit damp, the yellow in the birds eyes and nose off set against the grey of the feathers presented a shot I had to get. If you look closely in the right hand side of the image, you can even see several raindrops falling. Rain or shine, there is always something interesting happening at a National Park. You just have to look for it (and be sure you have rain gear). This image is available for purchase here.